Kalahari Books - Philosophical lectures: 1818-1819. Home Kalahari Bookstore Philosophy Philosophical lectures: 1818-1819. 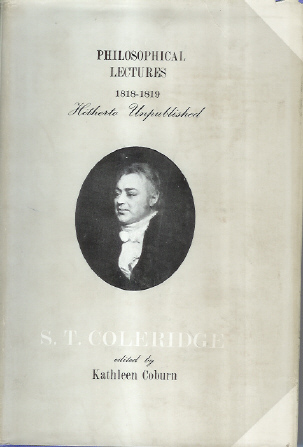 Author : Coleridge, Samuel Taylor. Edited by Kathleen Coburn. Publisher : The Pilot Press Limited. First edition with blue cloth coloured boards, cover and spine title embossed in Gold. The spine is pumbed with a small nick out of it. Owners stamp on end papers. The book is clean and ferm inside. The dust jacket has edge tears, and creasing.